Given its purpose and common applications, caulk often needs to go places where the gun doesn't fit. In those situations, you can extend the reach of the tool using this simple, ingenious trick. 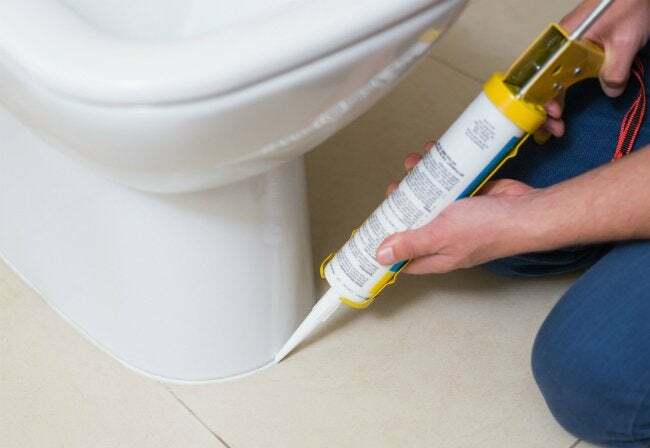 Your good old caulk gun is a user-friendly tool—until you need to use it in a tight spot (say, the back side of a toilet). What to do? Here’s one idea: Make yourself a flexible extension to attach to the nozzle. It’s simple! Head to the hardware store and pick up some clear plastic tubing at least a foot-and-a-half long. Choose tubing with an interior diameter of a quarter inch. Gently work one end of the tube onto the tip of the caulk, then cut the other end of the tube at an angle—the same angle you’d cut into the dispensing tip of a normal tube of caulk. Now, squeeze the trigger of the caulk gun until you see the caulk nearing the end of the extension tube. Bend the tube to your target area and dispense as usual. If the tight quarters produce some wobbles in your line of caulk, no worries. Just use a wet finger to smooth the imperfections. Done? Finish by detaching the extension tube and cleaning it with a small wooden dowel. That way, the tube will be clear and ready for use next time.